On February 5, the Timoko system that LifeNets donated was installed at the "Revival" Centre. The TIMOKO is a unique product that was created to develop mental and physical abilities of children with special needs: disorders of the muscle-skeletal system, difficulty with coordination, motor skills, concentration and cognitive skills and developmental disabilities. "Your gift "Timoko" is already working. It is for children with infantile paralysis for the development of motor coordination in children hyperactive or inattentive. Children really enjoy using this as they significantly improve their psychological state and motility. I hope everything is going well for the two of you! I heard that you will be planning to come to The Revival in June for the 20th Anniversary. Friday they set up the new system that you bought for the center. I don't have much to say right now but I just wanted to send you some of the photos of the system. Doctor P will also send you some photos. 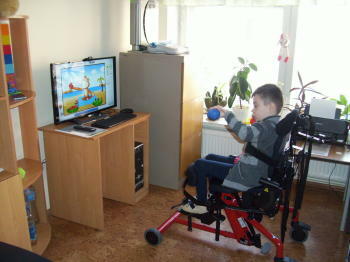 The TIMOKO correction and development system for children with special needs. It is designed to work with broadest range of children. It is perfect for developmental studies for children of middle school age and younger students. Games included in the system providing training opportunities for more precise motor skills and a high level of coordination. 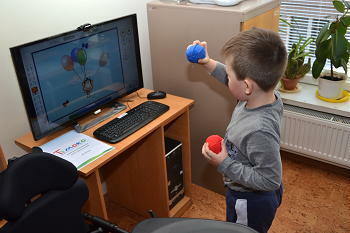 The correction and development system computer TIMOKO can be effectively applied to develop motor activity and cognitive function in children with a tendency to hyperactivity, the shortcomings functions account for the cerebral development aimed chiropractic action in rehabilitation work at post traumatic disorders of movement and coordination. On the beach: Improves strengthen the muscles of the shoulders, coordination and balance. Improving attention. In the sky: Improves muscle tone, strengthens the shoulders and reduce impulsive behavior.